I created prints of Milton. They look identical to the original and are available in three different sizes for in my shop. He’s one of my best sellers! I took a chance and submitted Milton to a flick group called Cutable. This was the first creation I submitted to that group. He made the front page of the Cutable Blog the following morning. This original was drawn with india ink, lightfast colored pencil and painted with Windsor and Newton Watercolor on Cold press arches watercolor paper. It is a cute little fish. I know you used India ink on this piece, but I was wondering what kind of Pilot Pens you use (gel, ball, etc)? Also, where do you buy them. I love the ink, watercolour, and coloured pencils together. They compliment each other so well. Thank you. They are called Pilot G-tec C4 pens. They are not available in the USA. Canada, the UK and Japan carry them. Here is a google link to help you out. I live in Canada and can buy them at my local Staples. 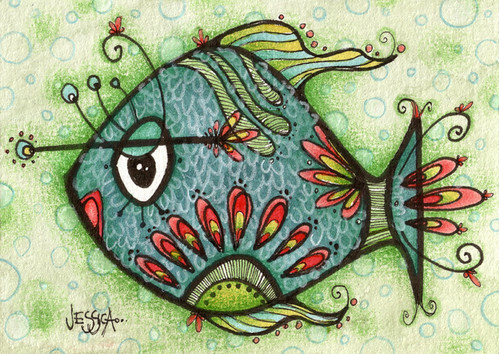 What a cute fish..You did a wonderful job and love the colors..